Not scoring the right song at the closing credits can make or break even the best of films. It’s a bit of a let down…sort of like missing the field goal after the touchdown. But when it all clicks and things end on a high note, it feels more like the cigarette that follows a really satisfying…you know….meal. Last week we gave high marks to the True Blood season finale for using a sinfully good Blood, Sweat and Tears cover and this week the trophy goes to the indie sweetheart Win Win. 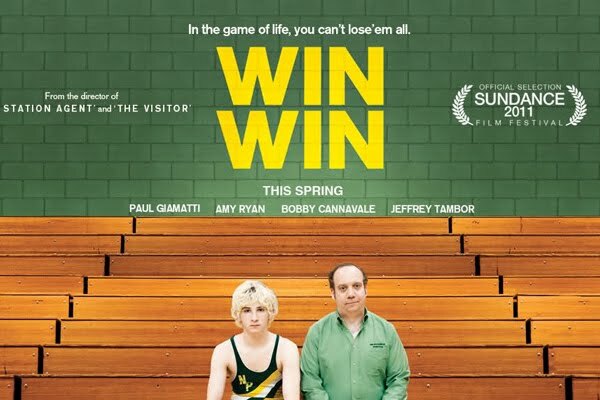 It’s another beautiful film from Director Tom McCarthy, who also gave us The Visitor (please tell me you’ve seen it) and the superb cast is led by Paul Giamatti and Amy Ryan with equally meaningful roles for Bobby Cannavale (loved him since The Station Agent..hope you’ve seen that one too) and Jeffrey ‘Hey Now’ Tambor. Burt Young also does a lovely job as the out of sorts curmudgeon. You know a movie is keeping it real when it can make you laugh and cry at the exact same moment, tapping into the purest of human emotions. It’s nicely scored all the way through by Lyle Workman whose credits include 40 Year Old Virgin and Super Bad but it’s really the closing track written by The National that completely nails it. The video below is especially good if you’ve already seen the movie so you if you decide to hold off until you’ve caught up, be sure to come back and get your last licks. A great film and a great song…now that’s winning. This looks like a great movie with a superb cast. Thanks for cluing me in. I still don’t get The National’s appeal, however.